Unmanaged forest ecosystems provide a diversity of ecosystem goods and services, and their ranks are moderate (food production) to strongly positive (e.g., fuel/energy, recreation, carbon sequestration, and regulating trace gases) (Table 2.3). Biotic and abiotic processes have almost equal contributions to the rate or efficiency of the delivery of these goods and services. Plant roots play an important role in the regulation of the quality and quantity of water volume and erosion control, whereas soil bacteria are particularly important for the regulation of the trace gases in the atmosphere (Wang & Ineson 2003). Mycorrhizal fungi play an important role in the formation of organic matter in coniferous forests (Smith & Read 1997), whereas earthworms have some impact in deciduous forests (Lavelle et al. 1997). In managed forests, the presence of soil pathogens, parasites, decomposers, and N2 fixers is a more important factor, especially in monospecific stands for timber or fuel-wood production (Waring et al. 1987). On the other hand, there are fewer natural sources of food, a less diverse range of macro- and microorganisms, and fewer soil habitats in managed forests. 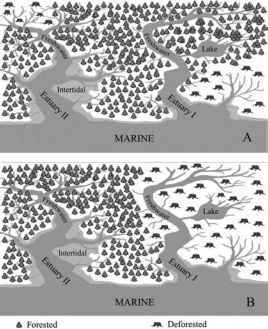 Conversely, the importance of abiotic factors in controlling the delivery of these ecosystem goods and services is little changed in managed forests, except for the potential role of external inputs, such as fertilizers and lime, in altering trace gas production, mineralization, and nitrate leaching. Intensifying forest management decreases the potential for carbon sequestration into the soil, and it also reduces sources of biochemicals and medicines by providing fewer habitats for other organisms. There is considerable diversity of functions of soil organisms in unmanaged and managed forests. Soil fungi play a more substantial role in decomposition in forests than in grasslands, and the role of plant roots in the delivery of ecosystem goods and services, for example in erosion control, is also more prominent. Forest management has relatively little effect on functional diversity of soil organisms, but it may change the importance of symbiotic nitrogen-fixing microorganisms to nitrogen availability, especially when monocultures of nitrogen-fixing trees are established. Humans can affect the diversity of mycorrhizal fungi, as can atmospheric deposition (Smith & Read 1997). Table 2.3 Provision of goods and services in temperate unmanaged and managed forest ecosystems. For further explanations, see Table 2.2.
than they do for grasslands, as most options differ by a unit of only one. However, forest management has large implications for biodiversity within forests, for example, the removal of wood, and/or soil erosion following large-scale tree felling (see Ineson et al., Chapter 9), can have important impacts on soil biodiversity and soil ecosystem services. Management for biodiversity and ecosystem functioning will have to balance the tradeoffs of selective tree cutting against felling of entire forest stands (see Ineson et al., Chapter 9). Selective felling of trees leaves a large proportion of the forest system intact, while complete felling can result in complete loss of topsoil due to erosion. Moreover, selective forest management promotes more attractive forests for recreational use.